Hometown Healthy Vending Machines of Houston is proud to offer Brothers All Natural (and Organic) Fresh Freeze Dried Fruit. Continuing to offer healthy vending machine snacks in local area schools is important to us. Brothers all natural fruit snacks meet the Texas FMNV (Foods of Minimal Nutritional Value) policy and the new “Smart Snacks in Schools” Policy. Conroe ISD area school healthy vending machines are now stocked with the great tasting healthy snack. 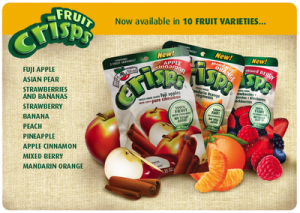 Currently, we offer three varieties… Fuji Apple, Apples Cinnamon, and Strawberries and Banana! Shoot us an email and let us know your favorite.